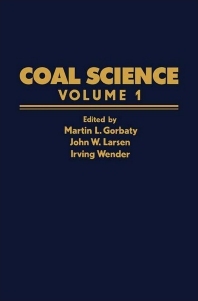 Coal Science, Volume 1 presents and evaluates the fundamental scientific areas involved with the structure, reactivity, and utilization of coal. This book reviews the coal's inorganic structure and reactivity and the role that ionic bonding plays in coal's chemical and physical structure and reactivity. Organized into five chapters, this volume begins with an overview of the characteristics of coals that are attributable to plastic substances. This text then examines coal's organic components that are derived from complex plant materials by complicated biological and chemical reaction processes. Other chapters consider the valuable tools in coal research, including electron spin resonance and nuclear magnetic resonance. This book discusses as well the problem of determining the molecular structure of the organic part of coal. The final chapter deals with the reductive alkylation reaction and other pertinent procedures such as reduction without alkylation and alkylation without reduction. This book is a valuable resource for chemists, engineers, and research workers.